MGM Resort is one of the top tourism resorts in chennai. Located near Mahabalipuram Tamilnadu, this luxury resorts beach in Tamilnadu offers all facilities required for a perfect vacation. MGM Resort is accompanied with green coconut palms, bright tropical flowers, lush lawns, Jaunty butterflies, curving sands and cool wind caressing your cheeks. Some of the facilities provided by the MGM Luxury resort beach are restaurant, bar, conference hall, banquet facility etc. This resort is about 40 minutes drive from Chennai. It has a beautiful beach stretching for long miles no end. A crocodile farm where several species of Indian and African crocodiles are bred in open meshy enclosures and a lake formed out of the back waters. MGM resort first opened its gates way back in 1993. This resort has proudly and professionally served its guests for more than a decade. MGM resort is a place where you can be refreshed and relaxed in style. Staying here makes every single aspect of your time spent enjoyable and heartwarming. Here you can experience the perfect holiday. MGM resort is ideally placed on the East Coast Road which is included by amusement park and a heritage museum. Both these places offers quality holiday experiences for the tourists. 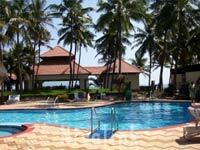 Pool resort is well maintained with two attendants offering service round the clock . 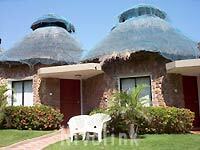 It is surrounded by stylishly placed coconut trees. If you are an early bird watch the sun peek out of the ocean as you run along the jogging track. Evening and late nights are also good to give your jogging pairs some good moments. Stretch your muscles sweat out, and much more at well equipped gym. There is yoga trainer with whom you can try different asanas. There is more facilities which is uncountable some are Jacuzzi and steam bath, Tata ayurvedic centre, Bonfire and Barbeque, Indoor/outdoor games, Live band music etc. The nearest airport and railway station is Chennai. The resort is 23kms from Chennai and about 45 minutes drive.